According to Discovery’s new mini series How Booze Built America, the pilgrims landed at Plymouth Rock not because they planned to (they were sailing for Virgina) but because they ran out of beer. Had I known this in high school, I probably would have paid much more attention in history class. Starting Wednesday, September 19th at 10pm E/P, booze-infused gems like this one will be strung together to tell the story of how adult libations have influenced some of America’s most iconic moments, from the Johnny Appleseed’s quest to plant apples (for hard cider as it turns out) to the space race (which was pushed forward by JFK, who never would have won the presidency without the money his daddy made as a bootlegger). What could be better than that? Well, having Dirty Jobs’ Mike Rowe host the thing, which is exactly what Discovery has done. Appearing on SiriusXM’s Opie & Anthony Show, Mr. Rowe says How Booze Built America was born out of boredom. Dirty Jobs had hit the 300th episode mark, and had been filmed in all 50 states and Australia. He was a bit burned out, and when asked what he’d be more interested in exploring, he said booze and history. The result is three weekly installments that fuse together these two very things. It sounds like the format will follow one of my favorite geeky treats from when I was a kid, the show Connections hosted by science historian James Burke. Each episode follow the meandering path of how a seemingly small event from the past, like the invention of the touchstone in ancient civilizations, led to a modern-day thing like nuclear weapons. In How Booze Built America, it’s how the berserk actions of Carrie Nation, the hatchet wielding woman who used to go bust up bars to protest the sale of alcohol, eventually led to America landing the first man on the moon. It sounds like my kind of show – Connections with hooch! 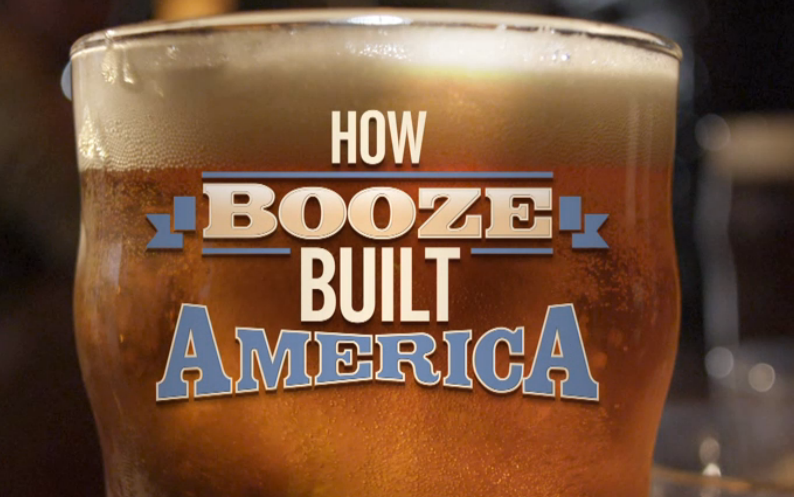 How Booze Built America premiers on Wednesday, September 19th at 10pm, with a new installment to follow each of the following two Wednesday nights. Of course there’ll be tons of reruns (people love Mike Rowe AND booze! ), so if you miss it, just check the interwebs for when it’ll be on next. I am happy about this, but I would be even happier if somehow Prof. Brian Cox was hosting. I’m guessing that’ll be covered here, hopefully with a hearty dollop of snark. Don’t forget the bootleggers who had higher profits from Prohibition. Bootleggers and Baptists go together like beer and pretzels. True – a lot of people don’t realize that. For years Santa Rosa County (Florida) was a dry county – up until a few years ago , in fact. Bootleggers supported the dry laws & were often instrumental in having the local Baptist preachers push their congregations to always vote against becoming wet. I guess booze is still building Alabama at a slower pace. To each his own Don. I am loving it. I am completely geeking out. Whiskey as money? Cool. The daily liquor rations to soldiers and the men who dug the Erie Canal. It’s irreverent, and not at all like my 8th grade social studies courses. Drunks making history. Who knew?